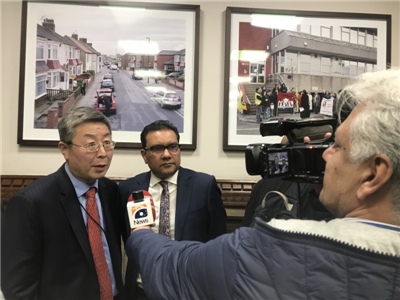 On February 4, Minister Ma Hui attended and addressed the Belt and Road Initiative (BRI) and China-Pakistan Economic Corridor (CPEC) APPG Inquiry Launch. 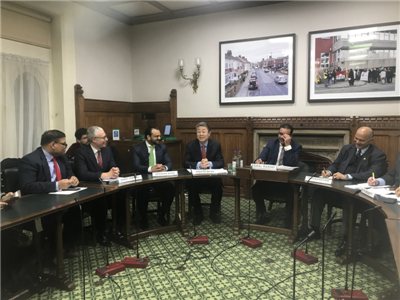 Over 60 people were present, including Faisal Rashid MP, Chairman of All Party Parliamentary Group of the Belt and Road Initiative and China Pakistan Economic Corridor (APPG), Giles Watling, APPG Vice Chairman, Barry Gardiner MP, Shadow Secretary of State for International Trade, Khalid Mahmood MP, Yasmin Qureshi MP, Keith Bennett, Deputy Chair of the 48 Group Club and representatives from the UK parliament, business, academia, and media, as well as Nushahid Hussain Sayed, Chairman of Senate Foreign Affairs Committee of Pakistan, and Muhammad Javed Abbasi, Chairman of Senate Standing Committee on Law and Justice of Pakistan. Ma noted that the BRI has become an important platform for international cooperation since it was proposed five years ago and has already delivered tangible results and gained extensive support from the international community. The BRI is an open and inclusive big stage, not a closed shop. It is a high-quality and sustainable economic and trade cooperation initiative, not a geopolitical tool. It is a “pie” to share, not for China’s exclusive consumption. The UK is a natural partner of China in advancing the BRI. China stands ready to work with the UK to ensure that the BRI cooperation is carried out in a way that is of higher quality, at higher standards and with higher return. He expressed the hope that APPG would continue to leverage its unique advantages to support, take part in and promote China-UK cooperation on BRI and CPEC. Hussain spoke highly of the BRI and the contribution of CPEC to the economic and social development and to the promotion of trade and economic cooperation between the countries along the Silk Road including Pakistan. Citing the development in the CPEC, he refuted the accusations of the BRI “debt trap”, China’s “export of labour”, and “military expansion”. Bennett said that the UK should leverage its strengths in the fields of law, finance, project design and service industry to actively participate in the BRI cooperation and CPEC in particular to share the opportunities of development. Ma also answered questions from the audience and Pakistan media on the BRI environmental protection standard, security issues, the docking with the UN’s 2030 Agenda for Sustainable Development, and the participation of British financial institutions in the BRI cooperation. 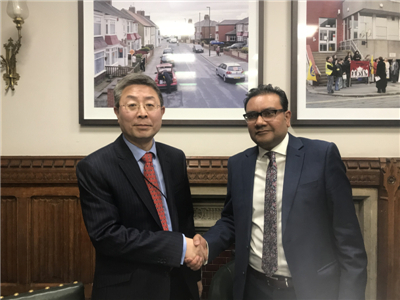 The All-Party Parliamentary Group for the Belt and Road Initiative and China-Pakistan Economic Corridor was founded and chaired by Faisal Rashid MP of the Labour Party in June, 2018. It comprises about 40 Lords and MPs of the Conservative Party, Labour Party, Liberal Democrats and Democratic Unionist Party of Northern Ireland. The group aims to help the UK public to understand, support and participate in the BRI and provide a platform for exchanges and cooperation between governments, parliaments, industry and business sectors, and academic institutions of China and the UK to promote China-UK cooperation on the BRI and the tripartite cooperation of China, Britain and Pakistan. On September 10, 2018, Ambassador Liu Xiaoming attended the launch of the Group and delivered a keynote speech.